Overnight Camper = Sunday 4:00pm through Friday 6:30pm. Day-Only Camper = Mon-Fri daily 8:00am-6:30pm. Storytelling through images and sound. In addition to all the exciting activities of Resident Camp listed below, Digital Arts Campers will have daily training in photography, videography, and creating engaging digital content for compelling storytelling. Monday through Thursday, campers will “embed” in reporting pairs into their assigned Unit to document that group’s week-long story. D.A. Campers will regroup daily before dinner in our computer lab to organize data (photos, video, audio) and to create their stories. D.A. Campers will individually produce a “Video Story” for the Unit into which they were embedded, and the D.A. Unit will collectively produce the total week’s Video Story shown to everyone at Thursday night’s Skit Night and at our community exhibition for families on Friday after dinner. D.A. Campers will also create “video News shorts” projected during meal announcements in the Ark Dining Hall. 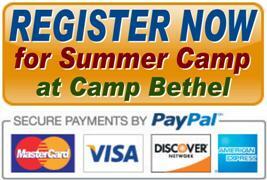 All videos and shorts from the week will be featured on-line at Camp Bethel’s YouTube Channel. Bring your camera, video camera, or smart phone*, any attachments/lenses/mics/gear you may have, and your laptop for daily video work, (or borrow Camp Bethel's clunkers); details will follow in your Confirmation Packet. Each Digital Arts Camper also receives their entire week’s portfolio on a Camp Bethel Flash Drive. Activities for the week also include group games, nature, crafts, music and singing, campfires, swimming, low-ropes group challenges, creek-fun, hiking the camp trails, archery, orienteering and geocaching, slack-lining, GaGa Ball & 9-Square, Morning Watch, Bible study, polar bear swims, night activities, special all-camp programs, an evening on the climbing wall, and high ropes course, zip line, and Flying Squirrel! On Tuesday or Wednesday your unit will cookout in your Home-in-the-Woods and have the option of one or more overnight camp-outs (see Opt-Out information below). Digital Arts Campers will reside in cabins on main campus and spend each day with your co-ed family-unit of 10-12 campers and 2-4 counselors. This is a great week of spiritual development, fun and adventure; exploring your extraordinary faith journey TOGETHER and "Letting the Peace of Christ Rule." For an additional fee (billed to you later), choose one of the available "add-on" activities for your chosen dates, (see list and dates below). Be here for an awesome week! ​Subisidized Fee (discounted cost) = $400; Supporters Fee (actual cost) = $450; Sustainers Fee (cost + $50 gift) = $500. "Add-on" activity pricing is below, and Add-on fees will be billed to you separately. Week-long campers have the option to add River Tubing, Equestrian, Horseback Riding, or Whitewater Rafting (week 2 only) only one per week, and see below for when each is offered. If you are coming to camp with a friend or cabin mate, you do not have to choose the same optional activity. For example, Betty and Sharon can be in the same cabin/unit even though Betty is choosing Tubing and Sharon chooses no extra option. On Home-in-the-Woods night for week-long Resident Camps (see individual camp descriptions), your child may choose to opt out of the overnight sleep-out with their group and instead sleep in a cabin with our Leadership Team. To opt-out of sleep-out, check the “Opt-Out” box in your registration form. We want EVERY child to feel comfortable and have FUN during their time at camp.